Good weekend! I've been preparing for some time to umpire an epic-length attempt at playing the political strategy boardgame Republic of Rome, over at the Grogheads forum, using a Tabletop Simulator mod as a player aid. I'll be kicking off the game Monday afternoon (Central US Standard) September 17th. We've still got some slots open, so I'm posting invitations beyond the Grogheads forum for the final weekend. The thread introduces the game and its principles: http://grogheads.com/forums/index.php?topic=22819.msg628433#msg628433 . 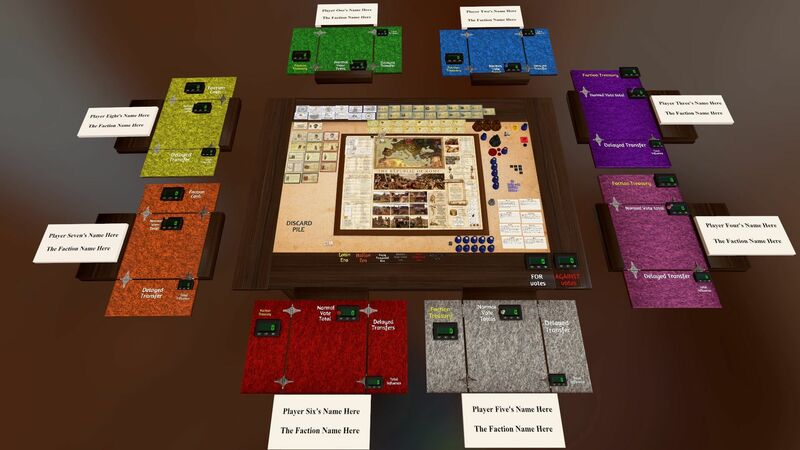 It's a card-driven political game (although there are only a few secret cards) where players are cooperating with each other to keep the Roman Republic alive longer than historically, from its early beginnings fighting against the final Roman king, to its final period of civil war in the 1st century BC. The game itself is not only trying to beat all the players, but is designed to tempt individual players into competing with each other for power to get things done efficiently in the game, even eventually to try to win the game alone as the Emperor (either legally by being elected Consul for Life, or in rebellion against the Senate). The game has been around since the middle 90s, if I recall correctly, and has an infamous reputation due to the complexity of its rules. But I came to realize that if a person acted as game-master to umpire the rules, the other players could concentrate on the fewer actions necessary to actually play the game. So as umpire I would be giving reports to the players (including a little secret information by the forum's p-mail, but most information is totally public), and then running the results of their choices in the background. Play can be asynchronous this way, with players checking in on the thread occasionally, at their own paces, to see if they need to take any actions or discuss any plans with other players. There are slots for 8 players, although the game is designed for 6 nominally. I'll be hotpatching some rule variations together, along with a few extensions of my own (like special faction abilities for each player). The April 2018 Living Rules are available at the thread linked below (also at Boardgamegeek), and also an extended flow-list for the rules which I'll be using to run the game. But the setup I'm using acts as a tutorial for the game to introduce and unlock game factors over time. So it starts relatively simple and adds more choice options for players over time. Again, I'll be starting the initial game on Monday afternoon Central US time (there is no exact time as it depends on when I get off work, and it'll take me some time to generate the game-start information). But players won't have to wait around, just check in on the game thread occasionally (which I'll post when we start) to see if there's new information or if it's now time to make some choices about what you'll do (or to leave each other messages about plans, publicly or privately). Also, we already have a minimum feasible number of players for a multiplayer game, so we'll start Monday afternoon regardless, but if anyone watching the game wants to join in after we start, I can pretty easily integrate new players throughout the game (although you may have to wait a little while before your faction phases into effect). 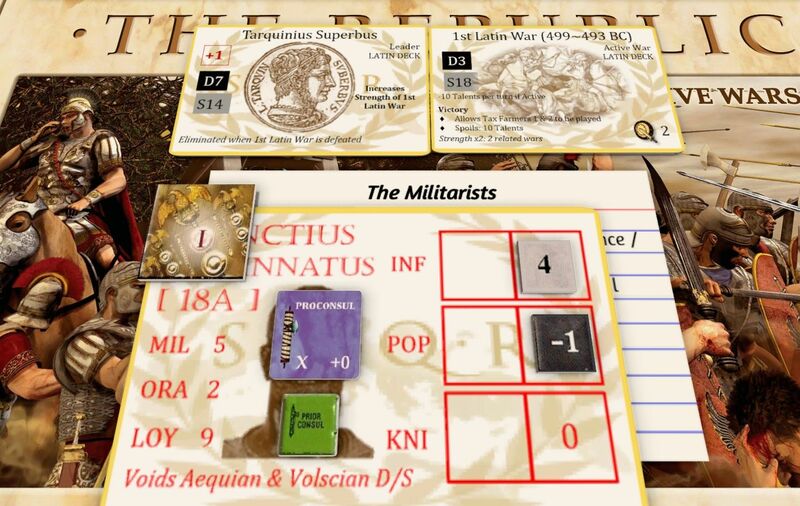 As a quick sample: here in a test run, the Militarist Faction player has had one of his senators, the Statesman Cincinnatus, elected as Field Consul to prosecute the game's first war (against Tarquinus Superbus, although the prologue designer sort of blends together three early wars into the "1st Latin War".) He didn't roll well, though, despite coming to this war with several advantages, and lost most of his army, taking a hit to his popularity (now at minus-1). But he wasn't outright defeated, so he'll remain in the field until at least the Senate Phase of the next turn (where the players may vote to recall him, or to raise and send him reinforcements), as a Proconsul. But despite his "standoff" failure, he did at least prosecute the war so the Unrest of the people hasn't risen -- yet. Started by FrankieBoard Support / F.A.Q.